Students and physicians learned about the Home Care Program. Northwestern University’s Feinberg School of Medicine invited UIC Specialized Care for Children’s Director, Thomas Jerkovitz, to share the vision for the Home Care Program during Grand Rounds on September 5th, 2014. Grand Rounds is a lecture series for faculty, residents, and fellows. About 100 medical professionals listened as Director Jerkovitz talked about the history of the Home Care Program and how it has changed. His goal was for students and physicians to understand the role of Specialized Care for Children. He also talked about the benefits of Specialized Care for Children, physicians, hospitals, and other providers working together. 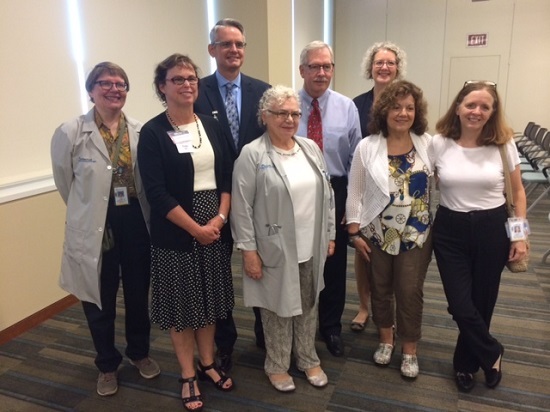 Pictured above (from left to right): Dr. Denise Goodman; Cynthia Booth, APN; Thomas Jerkovitz, Director of Specialized Care for Children; Dr. Zehava Noah; Patrick Magoon, President & CEO of Ann & Robert H. Lurie Children’s Hospital; Cindy Budek, RN; Susan Navarro, RN; and Dr. Barbara Bayldon.